It’s mid-April now people. Where exactly are Kenya’s reefs in the current worldwide bleaching event? According to the Coral bleaching response guide 2016 (Western Indian Ocean) that was put together by CORDIO’s East Africa director, David Obura, we should be “monitoring bleaching, mortality, recovery” . So what are the best practices for monitoring reefs? Ideally, you’d want to visit a site bi-weekly for the duration of the bleaching event . However, costs are of course a huge factor, and many of the organizations monitoring reefs off Kenya’s coast are underfunded [2, 3]. With this limitation in mind, Obura suggests making sure to observe the peak of the bleaching, so mortality can be attributed to bleaching and not some other factor . So far bleaching has been far less severe than predicted in this part of the world . CORDIO’s bleaching alert for April 15th announced that a shift away from the rougher SE monsoon winds has resulted in a strong cooling effect over the past two weeks . Additionally, the tropical cyclone Fantala began to make its way east and is predicted to further dissipate the current hot spot on April 18th . Currently, CORDIO places the Kenyan reefs on the ‘warning’ alert level [report citation]. This level means there are could be warmer-than-usual condition which could potentially cause some bleaching . Back in early March, Jennifer O’Leary, a marine ecologist at California Polytechnic State University, who has been working in the area since 2010 reported the observation in yellow near Mombasa . O’Leary documented a low level of bleaching (1-10%) which was ‘spotty’, and a mortality rate of 1-10% . The greed dot represents a report of no bleaching from Obura ten days after O’Leary’s . The reefs did not however, escape the next month of this mass bleaching event unscathed. Further north in the Watamu Marine National Park, three reports of bleaching were recorded . The next report was made March 20th by Peter Musembi, who reported low (1-10%) levels of bleaching and a mortality rate of less than 1% . Despite this seemingly mild observation, the corals that were bleached (largely Pollicopora) were “totally bleached white” . Just up the shore, another report of low level bleaching was made three days later near the same location by Mishal Gudka of CORDIO . Gudka reported more totally bleached corals, this time of the species Acropora galaxea . 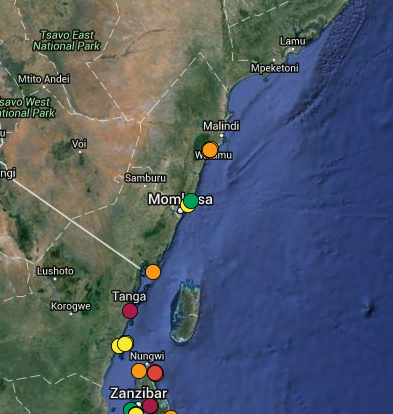 The last recorded and most severe bleaching observation was made two weeks ago again by Musembi . He estimated that between 10 and 50% of live coral had been bleached with Pocillopora and Acropora faviids taking the brunt of the bleaching . Though we end our story on a bit of a low note, conditions on the reef are improving. Hopefully we can use the knowledge gained from observing this bleaching event to better prepare us for the future. Obura, D. O. (2016) Coral bleaching response guide 2016 (Western Indian Ocean). http://cordioea.net/bleaching_resilience/wio-bleaching-2016. Obura, D.O., Tamelander, J., & Linden, O. (Eds) (2008). Ten years after bleaching – facing the consequences of climate change in the Indian Ocean. CORDIO Status Report 2008. Coastal Oceans Research and Development in the Indian Ocean/Sida-SAREC. Mombasa. http//:www.cordioea.org. Wilkinson, C. (2008). Status of coral reefs of the world: 2008. Global Coral Reef Monitoring Network and Reef and Rainforest Research Centre, Townsville, Australia, 296 p.
NOAA Coral Reef Watch Methodology, Product Description, and Data Availability of NOAA Coral Reef Watch (CRW) Operational and Experimental Satellite Coral Bleaching Monitoring Products (2011) NOAA Satellite and Information Service. CORDIO: East Africa (2016) WIO Coral Bleaching Alert– what to expect? This entry was posted in Uncategorized and tagged bleaching, Climate Change, coral, Kenyan reefs, Marie, mass bleaching event. Bookmark the permalink. Bleaching of coral reefs and increase in mortality rate is a grave issue and needs immidiate attention from the Kenya Government otherwise remaining corals would also have to face the same scenario. Thanks a lot for sharing this post.